A very attractive form of the localized Panamanian terrestrial, Anthurium papillilaminum, shown in nature. This species can be quite variable in leaf shape and size in cultivation and at this locality, perhaps due to the influence of the sympatric A. ochranthum. Among ornamental tropical aroids, velutinous/velvety upper leaf surfaces are ubiquitous across both the family and within many popular genera. These include Philodendron (e.g. P. verrucosum, P. gigas, P. luxurians), Alocasia (e.g. A. micholitziana, A. reginula), Amorphophallus (e.g. A. atroviridis), Syngonium (e.g. S. rayii) and, of course, most famously in the genus Anthurium. Velvet-leaf anthuriums with contrast-colored leaf veins have been justifiably popular in ornamental horticulture since the late 19th century. Many currently popular species originating from Colombia and Perú, such as Anthurium warocqueanum, A. magnificum, A. crystallinum and A. regale, were first grown as denizens of European hothouses during the late 1800s. Like most delicate tropical foliage plants, they faded from cultivation following the First World War, slowly regaining popularity among western plant collectors again during the 1950s and 1960s (see Alfred Graf’s “Exotica” Series I, 1957). Some of the more attractive species are also popular as garden or houseplants in Latin America and regularly collected from nature in southeastern México, Colombia and Ecuador. A mature Anthurium magnificum “Norte” growing the author’s collection in California. Note the very prominent wings on the petioles and peduncle of this plant. All images shown here and not attributed to others are the author’s, both in nature and of his cultivated plants. Photo of the lower leaf surfaces two wild-collected specimens of the oft-times velvety-leafed Upper Amazonian Philodendron lupinum. Despite efforts to mimic native conditions, cultivated plants never achieve this degree of violet saturation on their abaxials. Longest leaf shown ~12”/30 cm. Image transfer from 35 mm slide. Epidermal cells that are micro-papillose, markedly convex or conical assist in the capture of diffuse light prevalent in forest understories. 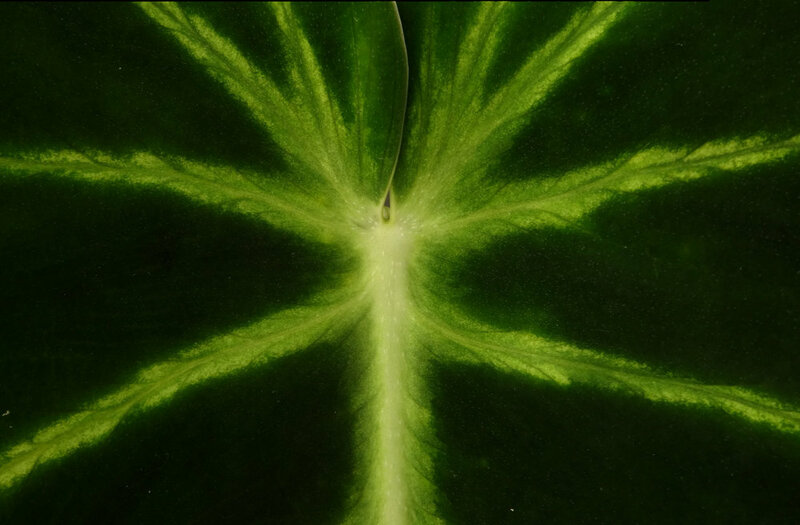 As was mentioned in the post on bullate-leaf anthurium species on this site, leaves with velvety or matte-subvelvety surfaces that are the result of the presence of these “convex lenticular cells” also appear to shed water more efficiently than glossy leaves. This feature is another advantage in the permanently wet rainforest and tropical pluvial forest ecosystems these plants inhabit. Likewise, the pink or violet abaxial/underside surfaces of leaves in many of these species appear to be an adaptation shared across a wide variety of tropical forest understory plants to facilitate in capture of Photosynthetically Active Radiation (PAR, i.e. the spectral solar radiation range of 400-700 nanometers) in deeply shaded environments. It is believed that these violet abaxial surfaces have evolved to reflect significant amounts of PAR that has traveled through the upper leaf surface back into inner, chloroplast-rich tissue where it is absorbed. Section Cardiolonchium includes a large selection of Anthurium, currently numbering well over 250 published or accepted species (fide Thomas Croat, Missouri Botanical Garden). Many of these are suitable for ornamental horticulture as house, conservatory or garden plants in suitable climates. It is broadly categorized as having B (=supernumerary) chromosomes, often possessing velvety leaves with smooth, ribbed or winged petioles, and greenish-violet or purple and white fruits. Western and southern Colombia are particularly rich in section Cardiolonchium diversity, so the final count for the section will almost certainly be higher as previously unexplored areas of the country are botanized. Note that there are a number of species in section Cardiolonchium that do NOT have velvety upper leaf surfaces, such as the central Panamanian endemic A. cerrocampanense as well as more widespread and variable species like A. rubrinervium and A. ochranthum. Shown above right, two attractive but poorly-known section Cardiolonchium; at left the compact, terrestrial Anthurium sp. “Perú and right, a new leaf of the hemiepiphytic A. triciafrankiae. There are also a few somewhat aberrant section Cardiolonchium species in cultivation that have “odd” morphological characteristics, including Anthurium warocqueanum (B chromosomes absent, small orange fruits), together with the showy but less commonly-seen Panamanian endemics A. folsomianum and A. panamense (shown below). Left, Anthurium folsomianum in greenhouse cultivation in California and right, A. panamense as a garden plant in Guatemala. Cultivated species of note include: Anthurium dressleri, A. papillilaminum, A. crystallinum, A. besseae, A. regale, A. magnificum, A. marmoratum, A. dolichostachyum (incl. “angamarcanum”), A. portilloi (sp. ined. ), A. forgetii, A. warocqueanum, A. waterburyanum (sp. ined. ), A. queremalense (sp. ined. ), A. metallicum, A. cirinoi, A. grande and many hybrids involving these species. An early-issue young Anthurium metallicum growing potted in pure tree fern fiber in the author’s collection in Guatemala. Despite relatively few species from this section occurring there, three out of Panamá’s eight native section Cardiolonchium species are very popular with hybridizers (A. crystallinum, A. dressleri and A. papillilaminum). From my perspective, the latter two species are of particular value in modern foliage-type anthurium breeding programs because they exhibit some of the most velvety-looking leaves in the genus and consistently add very dark color tones to their hybrid offspring. Section Andiphyllum has a few velvet-leaf species from southeastern México and Guatemala including Anthurium clarinervium, A. leuconeurum and a few natural hybrids (incl. A. lezamae ?) involving these species. Species now assigned to this section were formerly included in both Cardiolonchium and Belolonchium. 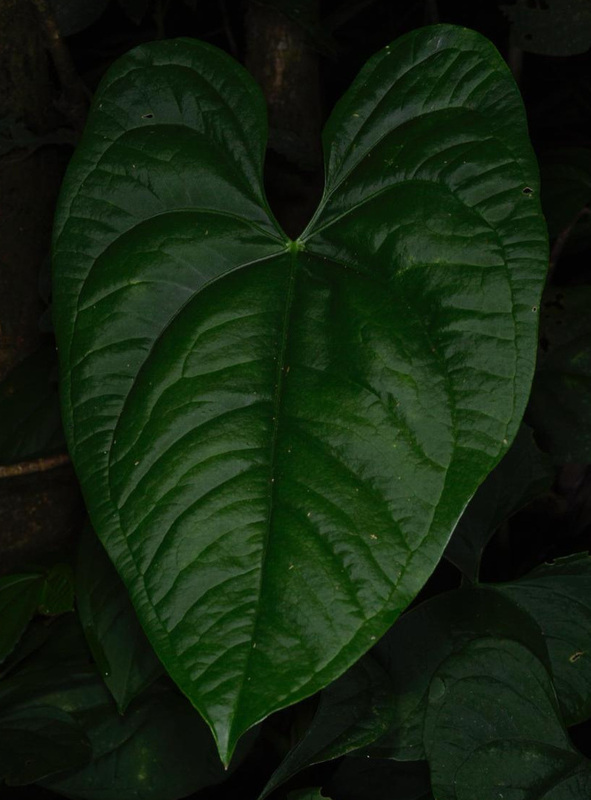 A very atypical terrestrial and sometimes subvelvety member of section Pachyneurium from Costa Rica and extreme western Panamá, Anthurium schottianum in nature. Image: F. Muller. Section Pachyneurium has two notable species in cultivation that have subvelvety-velvety upper leaf surfaces. The best known of these is a classic birds-nest type with dark pink or violet undersides; the handsome and popular Anthurium willifordii originating from upper Amazonian Perú. Other less commonly-cultivated species that are also subvelvety include the very striking Costa Rican endemic, A. schottianum. Section Porphyrochitonium – a few of the larger species from very shady environments also have subvelvety leaves, most notably the Ecuadoran Anthurium pallidiflorum and the southern Central American A. wendlingeri (see post on the latter species elsewhere on this site). Interestingly, some velvet-leafed aroid species lose this trait to a greater or lesser degree over time, normally when exposed to brighter conditions. This supports the notion that strongly convex epidermal cells are an adaptation to improve capture of low light levels. However, at least one shown above, Philodendron lupinum, an eastern Amazonian hemiepiphyte begins life with cordate, black-green velvety leaves with violet under leaf surfaces and becomes a glossy (with plane upper epidermal cells), sagittate leaf plant as it matures. In this case, the conversion is not the product of higher light intensity. Even plants grown in very deep shade lose their velvety appearance as leaves mature, so it is apparently leaf size - not age – that triggers the epidermal changes. Trials have shown that cutting-grown plants artificially maintained as untrellised, terrestrial runners can retain their cordate, blackish-colored, velvety juvenile leaves indefinitely. Other members of sections Cardiolonchium, Andiphyllum and Pachyneurium have matte-subvelvety or satiny-looking leaves throughout their lives. While less commonly-cultivated than velvet-leaf forms, a couple of fairly large species have found their way into cultivation, such as Anthurium dolichostachyum, A. sp. “Purple Velvet” and A. schottianum. Others have only recently been described but are promising subjects for horticulture and are in limited cultivation (e.g. the cool-growing Guatemalan A. archilae and Peruvian A. triciafrankiae). Long popular with tropical plant collectors, a number of velvet-leaf anthurium species have been hybridized over many years to produce plants with blended characteristics. More specifically, most hybridizers have sought ease of culture and full appearance required for the mass market, intensely-colored leaves and/or more distinctly-contrasted leaf veins. Currently, the most commonly cultivated forms include a myriad of “no-name” Anthurium crystallinum x magnificum, x A. forgetii, x magnificum hybrids, A. clarinervium as well as a couple of its hybrids, and A. warocqueanum. Most of these have made it to plant tissue culture (PTC) but are also often available from nurseries as seed-grown plants or divisions. A few species remain exceptionally rare in cultivation with only a handful of examples being grown outside their countries of origin (e.g. A. carla-blackiae, A. sizemoreae, A. archilae), together with many of the newest Australian and California hybrids. A still undescribed section Cardiolonchium from Ecuador, Anthurium portillae. A recurring problem for people interested in these plants is the lack of the original provenance of many, even those in botanical gardens. This commonly leads to confused identifications, even by very experienced botanists and amateur naturalists. Given the visual similarity of many of these plants, country of origin is a very useful piece of information to have when seeking a valid name. The plethora of NOID south Florida hybrids in the nursery trade can be a major challenge for botanists working with cultivated material, with some hybrids masquerading or deceptively marketed as species. Most velvet leaf anthuriums are somewhat temperature tolerant and, provided with high humidity, make excellent collectors’ plants. Many species commonly occur over 3,250’/1,000 m and a few appear to require cool nights to thrive over the long term. 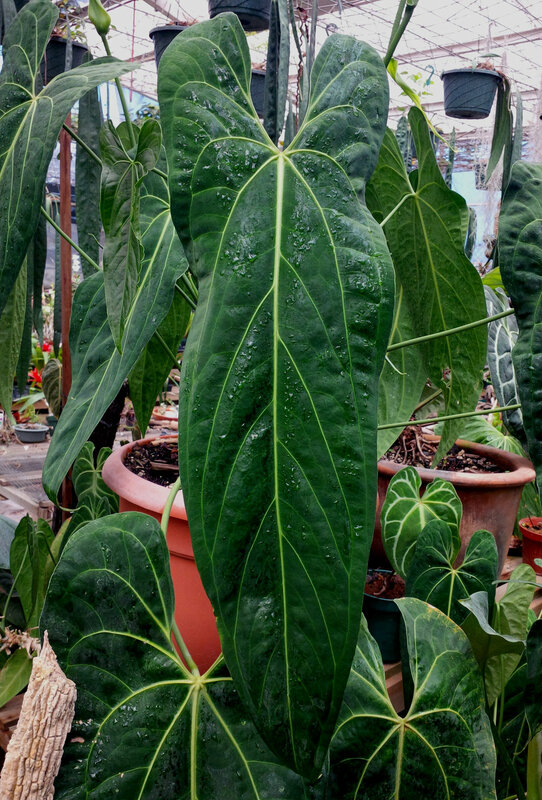 Some, like the giant Bolivian Anthurium grande, range as high as 7,600’/2,350 m. The majority of popular species in cultivation have leaves between 16-28”/20-70 cm in length. However, two species long in vogue, A. warocqueanum and A. regale, can have leaves that well exceed 3’/1 m in length when mature and will take up a lot of bench space when well grown. The true giants in this group, including many in the A. marmoratum species complex, such as A. queremalense and A. metallicum, can have mature leaf blades from 4-6’ long. Several vining hybrids can also attain impressive size (e.g. A. sp. “Purple Velvet” x marmoratum). While many of these velvet leaf tropical aroids have been in cultivation since the late 19th century, surprisingly few of them have been observed in nature by other than botanists or ornamental plant collectors. They do not generally persist in disturbed habitats other than on or adjacent to road cuts, so visits to primary forest are often required to view them in nature. There is a great deal of confusion surrounding the characters of one of the best-known species, Anthurium crystallinum, mostly stemming from its having been hybridized - both intentionally and not - for many decades. As early as 1951 in his book “The Cultivated Aroids”, noted aroid specialist Dr. Monroe Birdsey observed that cultivated A. crystallinum offered in the trade were “evidently” hybrids with the similar-looking A. regale and A. magnificum. True Anthurium crystallinum and A. magnificum remain surprisingly rare in cultivation, although the Ecuadoran orchid nurseries have recently improved the supply of both and currently offer different ecotypes of the latter species. Critical examination of the petioles of domestic nursery-source plants will usually reveal hybrid origins, since A. crystallinum has smooth, mostly terete petioles and A. magnificum has distinctly winged petioles that are cuadrate or pentagonal in scross-section. Their hybrids, including F1s and complex-types, will usually show some mix of the two when their petioles are examined closely. Anthurium magnificum is also known to hybridize in nature across sections to a pair of unknown species in at least one location in west-central Colombia. The resulting plants are quite distinctive looking but do not possess velvety leaves. I have also recently found intrasectional wild hybrids of A. papillilaminum and A. ochranthum growing alongside both putative parents in Panamá. Besides early crosses between Anthurium magnificum and A. crystallinum, other older Florida hybrids that are still in cultivation include A. clarinervium x berriozabalense and A. signatum x crystallinum (= A. x bullatum). Right, two rare cross-sectional hybrids, one natural and the other manmade. Left, the satin-leafed Anthurium magnificum x ? and right, A. subsignatum x crystallinum. Anthurium papillilaminum wild hybrid, apparently with A. ochranthum, growing in nature, Panamá. There were a fair number of noteworthy hybrids made involving the two dark leaf Panamanian species from the late 1990s through to the late 2000s, especially Anthurium papillilaminum x dressleri, luxurians x crystallinum, dressleri x luxurians, dressleri x crystallinum, papillilaminum x warocqueanum (and reverse), A. warocqueanum x dressleri, A. regale x dressleri, and A. radicans x dressleri. Only three of these hybrids show any evidence of white contrast veining. Most of these were made or remade by me in Guatemala; a couple others were done in Queensland, Australia and south Florida. Almost all are rarities in collections. Exceptional modern forms include several Australian hybrids involving Anthurium marmoratum and A. warocqueanum. One of them, produced by Chris Hall and Arden Dearden at Equatorial Exotics in Queensland, Australia, A. sp. “Purple Velvet” x marmoratum, is one of the finest large foliage anthurium hybrids available. It is easy to grow and propagate from stem cuttings and is extremely attractive as a pot plant. Another is my 2008 hybrid between A. regale and A. dressleri. After many years of struggling with it under cooler conditions in Guatemala and the SF Bay Area, I found that it needs much more warmth and some micronutritional tweaks to thrive. Plants moved to conditions akin to those of a classic “stovehouse” environment in the summer of 2018 suddenly spread their wings in early 2019. Now, both clones grown here are now showing larger, darker and more rounded leaves. Another of my older hybrids still being grown in very limited numbers in Guatemala, A. warocqueanum x dressleri, is also proving a handsome cross as it matures (see below for image). Above, two very good clones of the exceptional Australian hybrid, Anthurium sp. “Purple Velvet” x marmoratum, grown in California (left) and Guatemala (right). This very desirable plant will offset readily when mature and can grow 4’/1.20 m long leaves when given proper care and sufficient space. Shown above Anthurium sp. “Purple Velvet, the seed parent of the hybrid shown above. This remains an undescribed species from northern Ecuador. Left, a large seedling in California and right Chris Hall with a beautifully-grown example in Queensland, Australia. Many velvet-leafed Cardiolonchium freely hybridize within the section and outcrosses to the very attractive pebble-leaf species such as Anthurium luxurians are also interesting and will generate bullate offspring with very glossy, almost metallic-looking leaves. I have yet to produce a hybrid of any of the velvet leaf species crossed with a matte or glossy-leaf species and not lose the velvety aspect to the leaves to some degree. Contrast veining appears to be dominant in many crosses but, as was noted above, is often suppressed when pure A. dressleri and A. papillilaminum are used as parents, particularly when young. Outcrosses to other sections such as Semaeophyllium will also yield offspring that lack contrast-colored leaf veins. Some modern hybrids have recently been outcrossed into F2, such as Anthurium (signatum x crystallinum) x magnificum (Vannini), A. (sp. ‘Purple Velvet” x marmoratum) x warocqueanum (Hall and Dearden) and A. (faustomirandae x clarinervium) x ‘Ace of Spades’ (Rotolante). Other new intersectional hybrids involving sections Cardiolonchium, Andiphyllum and others are in the works, some of which look extremely promising. Anthurium clarinervium – one of the best-known velvet-leaf anthuriums and very popular with tropical plant collectors. It occurs discontinuously as a very compact terrestrial or lithophyte on karst, discontinuously at low and middle elevations in tropical wet forest from northern Chiapan highlands to the lowlands of northwestern Guatemalan in the Sierra de Chinajá, Alta Verapaz Department. Discovered in the early 1950s, it is now placed in section Andiphyllum that all share very large bright orange ripe fruits and single seeds. It requires heat and humidity to excel but can succeed as a slow-growing houseplant if not kept too dry. It is the best member of this group for novice growers, being both small and handsome. Hybridizes freely, but fruit can take up to two years to ripen. Recent reported intrasectional crosses (e.g. x faustomirandae and then outcrossed by Bill Rotolante of Silver Krome Gardens in Homestead, Florida) look very nice, and A. clarinervium has also been hybridized with other section Andiphyllum from México and Guatemala to produce more or less attractive offspring. It hybridizes in nature with A. pedatoradiatum and perhaps other sympatric anthuriums. With persistence it is reported to outcross to sections Cardiolonchium and Chamaerepium in cultivation. Anthurium clarinervium growing wild as a lithophyte in Tropical Wet Forest in Chiapas, México. This is what undiluted examples look like. Image: F. Muller. “Gold” emergent leaf on wild-origin, seed-grown Anthurium magnificum transitioning to green. Anthurium magnificum – a terrestrial, western Colombian endemic from intermediate elevations that may include several currently undescribed species ranging south into Ecuador. Leaves may be nearly orbicular in some populations, always showing prominent basal lobes. Petiole profiles can also vary but are usually winged with quadrate or pentagonal in cross-section. This species can hold large leaves, to over 30”/75 cm when well grown. It hybridizes promiscuously on both bench and in nature and in my experience its genetics usually dominate in crosses. Both the species and its primary hybrids are extremely popular with tropical plant collectors. Color and contrast tend to be improved in deep shade. Occasionally, some clones throw a few “golden” new leaves in response to who-knows-what, before reverting to normal color. Left, a large wild example of Anthurium magnificum growing in nature in western Colombia (Image: A. Dearden). Right, young, cultivated example from a nearby ecotype. Note the outwardly turned basal leaf lobes on both individuals. Two outstanding leaf forms on plants currently considered to be ecotypes of Anthurium magnificum that may be described as novel taxa down the road. Left, a juvenile A. magnificum “Norte” and right one of the so-called “green” leaf forms. Shown above, a very large and rare hybrid, Anthurium magnificum x warocqueanum that I made in the mid-2000s, shown above as both a juvenile in Guatemala and a mature plant in California. This cross produced very few viable seeds and is obviously dominated by the A. magnificum seed parent in terms of shape, but has the leaf veination of A. warocqueanum. A fully mature Anthurium warocqueanum grown by Cindy Hill in California. This exceptionally vigorous plant is grown in a large pot, with its stem mossed on a tree fern totem. Anthurium warocqueanum – another large leaf western Colombian endemic, hemiepiphytic (occasionally epiphytic) at lower and middle elevations. The acclaimed “Queen Anthurium”, discovered in the late 19th century in Antioquia Department. It has been successfully hybridized with several other section Cardiolonchium as well as with A. rugulosum, a section Polyneurium, in Hawaii. Requires high relative humidity and an upright support to hold a good number of leaves. Warmth, proximity to mist nozzles and/or a water feature are a plus. Larger plants must be fogged or mossed on totems to hold good leaf numbers. There are many ecotypes and local variants that are worth collecting, especially the plants with long, narrow, very dark leaves and a sparse number of leaf veins; the so-called “black warocqs” and “narrow forms” now in the exotic plant trade. Two readily differentiated forms of Anthurium warocqueanum as young F1s, shown in 6”/15 cm pots and grown in Guatemala. Left, the standard form, line bred by me and right, “black” or "narrow” form bred by Chris Hall and Arden Dearden, grown on from seed by me in both Guatemala and California. Two very good clones from my 2004 remake of John Banta’s Anthurium papillilaminum x warocqueanum hybrid, christened “Dark Mama” by him. These are nine year-old plants shown grown in Guatemala. Exceptional clones produce leaves to well over 3’/90 cm in length and can be much darker colored than these. I sent a number of siblings of these plants to NSE Tropicals in 2007 and was fortunate to obtain a small offset back from them in 2013 that I now propagate in California. Two additional hybrids involving Anthurium warocqueanum; left, my A. warocqueanum x dressleri and right, Chris Hall and Arden Dearden’s A. (sp. “Purple Velvet” x marmoratum) x warocqueanum growing in my collection in California. Anthurium papillilaminum - originally collected by Dr. Robert Dressler in the late 1960s on the Caribbean coast of Panamá in lowland rainforest adjacent to the Canal. Subsequent documented collections of wild plants appear to be rare, but this species was briefly common from seed-grown material in south Florida during the early 2000s. Apparently restricted to Colón Province, growing as a very localized terrestrial on very steep slopes and broken ground near sea level where it can sometimes occur close to the similar-looking A. dressleri. Surprisingly variable in leaf form and color, even within the same population, but all share subterete to terete petioles and yellowish green spadices. The best forms possess almost black velvet upper surfaces and violet crystalline undersides to their long, narrow leaves. When well grown, this is one of the most attractive of all foliage aroids. Some plants in cultivation appear to be the visually similar A. portilloi (sp. ined.) from Ecuador that was distributed as “Ecuadoran papillilaminum” by a well-known Florida aroid grower for many years. They may be differentiated by the triangular, sagittate leaf form, spreading basal lobes and matte-subvelvety upper leaves of A. portilloi. Two nice leaf forms of Anthurium papillilaminum. Left, a wild plant with slightly overlapping basal lobes and right, a 1980s-vintage collection of mine. This elongated “black” type is the most desirable leaf form in cultivation. Both plants show pink to pale violet colors on the undersides of their leaves. Central vein of Anthurium crystallinum ‘Crystal Hope’. Anthurium crystallinum – a terrestrial, lithophytic and epiphytic species, with subterete to terete petioles and yellow spadices. Some Panamanian plants may have slightly subterete petioles and pale green (as opposed to white) leaf veins. Basal lobes on these western populations also do not appear to meet or overlap like those in Colombian plants. Other than these, for two decades I have grown an accession from the Darién that has been tentatively identified as A. crystallinum but that lacks the contrasting leaf veins that identify this species and is probably much closer to A. papillilaminum. Anthurium crystallinum ‘Crystal Hope’ appears to be a small sport with vividly-marked leaves that was propagated on in PTC that is finicky in cultivation and difficult to maintain as an unclustered plant. This plant remains surprisingly difficult to obtain as a pure species. Some seed-grown Colombian origin plants are beginning to make their way back into horticulture from Andean country nurseries, which is a welcome development for collectors. Plants sold in the U.S. exotic plant trade with reddish or maroon new growth, as well as exceptionally large-leaf forms and labelled as this species betray their hybrid origin. Older hybrids that are routinely sold as A. crystallinum include x forgetii, x magnificum, x regale, x dressleri. An interesting, apparently undescribed terrestrial Anthurium sp. collected in the Darién Province of Panamá and previously misidentified as an A. crystallinum at a U.S. botanical garden. Its leaves, subterete petioles and inflorescence place it closer to A. papillilaminum. Author’s collection in California. Anthurium willifordii - this velvet-leaf birds-nest type appears to have been collected on very few occasions in Loreto Department, Perú. It was briefly put into PTC in the late 1990s. I found it in nature in 2000 as an apparently rare understory epiphyte growing adpressed to tree trunks about 25 miles/40 km airline southwest of Iquitos from where Charles MacDaniel, Jack Williford and others collected it in the 1980s. I hybridized this species with A. reflexinervium as the seed parent several years later. The resulting hybrids have very attractive satiny, rippled leaves, although lack the pollen parent’s violet colors. While easy to grow, they are extremely cold sensitive, as is A. willifordii. Together with other birds-nest anthuriums such as Anthurium superbum, A. hookeri and A. jenmanii, this species was in such high demand in Indonesia from 2007 to 2008 that larger plants routinely sold for staggeringly high prices. Above left, wild origin Anthurum willifordii growing in a commercial greenhouse in Guatemala. Right, my old hybrid A. reflexinervium x willifordii growing in my garden in Guatemala. Both are great plants that require warmth and high humidity to look their best. Anthurium dressleri – a terrestrial species that is restricted to low elevations on the Caribbean drainage in Colón and Panamá Provinces, Panamá. Leaves may be similar to those of some A. papillilaminum but it is easily distinguished by its distinctly winged versus subterete petioles, whitish spathe and yellow versus acid green spadix color. Specimens formerly reported from the Comarca de Guna Yala (= San Blas) represent another species, A. kunayalense. It was widely used in hybridizing following its discovery in the 1970s, where A. dressleri usually contributes its very dark-colored and distinctive velvety leaves. This is particularly evident when outcrossed to equally dark or darker-colored species, which may then produce violet-black new leaf colors in shade-grown plants. Slow-growing and sometimes fussy as a species, but well worth every effort to keep it happy. Its hybrids are usually fairly easy in cultivation. Line breeding by me has brought out occasional darker leaf colors in F1s and F2s; Peter Rockstroh grew out several dozen plants from a seedling batch of mine in Guatemala and ended up with several extremely dark clones that he grew as houseplants. Surprisingly cold tolerant, but very prone to aroid blight (Xanthomonas campestris pv. dieffenbachiae) when grown under sub-optimal conditions. The very showy, related and distinctive eastern Darién endemic, A. carla-blackiae (sp. ined), that was discovered a decade back indicates that other related Panamanian species may be out there. Above left, wild-origin founder Anthurium dressleri ‘#3’ in Guatemala; right a mature F2, line-bred A. dressleri growing in California. Two exceptional, mature examples of hybrids that I made in Guatemala between 2005 and 2008. Left, Anthurium luxurians x dressleri ‘Black Magic’ and right, a new leaf on A. regale x dressleri ‘Voodoo Child’. Both plants shown are being grown in California. Dark violet or blackish leaf colors require, constant warmth, shady growing conditions and attention to nutrition to express themselves to their fullest. Select, wild-origin A. dressleri clones (such as ‘#3’) were used to create these hybrids. Long confused with Anthurium dressleri, A. kunayalense is a central Panamanian rainforest endemic that I co-described in 2010 that - based on petiole and leaf morphology - now appears to be closer to the Colombian A. splendidum-luxurians-debile species complex. Anthurium marmoratum – a large hemiepiphytic or epiphytic species in high canopy, low and middle elevations of central and northern Ecuador north into central Colombia (Valle de Cauca) Easily confused with A. queremalense (sp. ined.) and A. cirinoi, two western Colombian narrow endemics from the Valle del Cauca and Chocó Provinces, respectively. When in flower, it is readily distinguished from both by its purple-tinged or violet, versus pale green, spadix. There are other similar-looking forms from Ecuador and Colombia that may end up being described as local variants or novel species. Some of these can develop very long and robust stems. Leaves to >4’/1.25 m in length in some exceptional forms. Improved availability from commercial sources over the past decade has made this beautiful climbing anthurium an extremely popular display plant for botanical gardens and private collectors with space. Following Chris Hall and Arden Dearden’s lead with their use of A. marmoratum as a parent, I have recently produced several novel hybrids involving a select form of this species as the seed parent that are at compot stage. Two excellent ecotypes of Anthurium marmoratum growing in my California collection. Left, a somewhat bullate leaf form from lowland rainforest in Pichincha Province, Ecuador and right, a Colombian plant that appears to have originated from an old collection at Marie Selby Botanical Gardens in Sarasota, Florida. Longest leaf shown on right is 32”/80 cm in length. Anthurium regale – a spectacular Peruvian endemic terrestrial at lower to middle elevations, well known from collections made at Tarapoto and Moyobamba, San Martin Region of the Upper Amazon. Leaves can exceed 4’/1.20 m in length. An absolutely gorgeous species that can also be a bit fickle in cultivation with many plants barely surviving in collections outside of the tropics as “one leaf wonders”. Warm days, cooler nights and large pots with long-lasting, free-draining media should improve its appearance. The combination of white under-leaf surfaces, cordate leaves with pronounced basal lobes, large size at maturity and terete petioles are diagnostic. This species was involved in some accidental and unremarkable south Florida hybrids back in the day, but recent crosses with species other than A. crystallinum are real standouts. Left, early wild-collected accession of Anthurium regale from Moyobamba, San Martín Region, Perú shown growing almost two decades later in California and right, a new leaf on a three year-old F1 A. regale in Guatemala produced from outcrosses between wild-collected plants available in the early 2000s. More examples of a very promising hybrid between Anthurium regale and A. dressleri that I made in late 2008. Left, a two year-old compot showing seedlings in Guatemala. Right, newly emergent leaf of one of two clones that I grow in California. This very striking bright red new leaf color slowly changes to chocolate brown with dark green hints as the leaves mature. Anthurium leuconeurum – a terrestrial or lithophytic species on limestone, including the possible synonym or natural hybrid A. lezamae and occurring discontinuously at middle elevations in cloud forests of the northern and eastern Chiapan highlands in southeastern México. Another section Andiphyllum with velvety leaves. Variable in terms of venation, leaf form and color within populations. May hybridize with A. berriozabalense in nature. The true species, as opposed to artificial hybrid “re-creations” made in several countries over the years, remains very elusive in cultivation but have recently been reintroduced in very limited numbers as seed-grown material of known provenance. Shown above left, a new leaf on a wild Anthurium leuconeurum in Chiapas, México and right, the very attractive and recently-described Guatemalan endemic, A. archilae. Both species are still exceptionally rare in cultivation. Images: F. Muller. Anthurium forgetii – a terrestrial, lithophytic and epiphytic plant at lower elevations in western Colombia to northeastern Ecuador (Carchí Province). Widely hybridized in south Florida over the years, so care should be exercised when purchasing plants from domestic nurseries, particularly if leaf shapes are not consistent with the true species. There is some variation among populations, but the true species should have nearly orbicular leaves to 20”/50 cm in length, extremely long, terete petioles and leaves should be conspicuously peltate throughout the canopy. Despite their penchant for readily producing “bench hybrids”, some clones are challenging to breed true to species. Imported plants advertising “silver veins”, etc. are just normal variations within the species. A pair of nearly orbicular-leaf, Colombian-origin Anthurium forgetii growing in the author’s collection in California. Above left, another very large F1 specimen from a batch of A. forgetii that I produced in Guatemala using the previous clone as a seed parent. Some of these were exported to the U.S. in the late 2000s. Right, a red emergent leaf on this plant in California. Anthurium queremalense (sp. ined.) – a giant terrestrial species, apparently restricted to middle elevation cloud forest in the vicinity of the old Cali-Buenaventura road in Valle del Cauca Department in western Colombia. An outstanding species in cultivation for those with the space to show it off. Easy in cultivation but requires warm days, high humidity and plenty of space to look its best. Left, a young leaf of a seed-grown example of the giant Anthurium queremalense (sp. ined.) from western Colombia in my collection. Right, a mature leaf of an immense specimen superbly grown by Dylan Hannon at the Huntington Botanical Garden in southern California. Anthurium villenaorum (sp. ined.) unfolding a new leaf in California. Note involute vernation on this leaf. Anthurium villenaorum – a low elevation, apparently epiphytic, localized north-central Peruvian endemic from the San Martin Region. It is surprisingly easy in cultivation and now widely grown in specialist collections in Florida and California although still fairly rare elsewhere. An aberrant section Pachyneurium with the involute vernation typical of that section, it can be subvelvety to velvety depending on culture with petioles sharply triangular in cross-section. Closely related to another Peruvian endemic and terrestrial, A. pulcachense, its leaf blades grow to ~30”/75 cm. Plants currently in cultivation are generally recent to very fresh imports but have been occasionally available as US-source seed-grown plants on both coasts since 2017. It is certainly an unusual and very handsome anthurium. I was a bit unconvinced about the allure of this species when I saw the first imports, but once I grew out a couple it has grown on me. I have a pair of flowering-sized plants as well as a few adolescents lurking in the shadows of the benches in my personal collection. Young mature example of Anthurium villenaorum growing in California. Author’s collection. The best U.S. collections housing a variety of velvet-leaf anthuriums are the Huntington, Missouri and Atlanta Botanical Gardens. The Lyon Botanical Garden (France) and Bonn Botanical Garden (Germany) also maintain an impressive diversity of these plants. Private sources for plants: Australia, Equatorial Exotics in Redlynch, Queensland and Exotica Esoterica (cyclanthaceae@gmail.com) in San Francisco, California carry both unusual species and their own specialty hybrids. Imported plants, if grown from old stem cuttings, may be of recent wild origin - caveat emptor. Seed-grown plants are always easier to grow. Left, ripe infructescence and receptive inflorescence of large mature Anthurium warocqueanum in Guatemala. Right, near-ripe fruits on an A. marmoratum infructescence in California. A group of three year-old F1 Anthurium warocqueanum growing on a greenhouse bench in Guatemala.